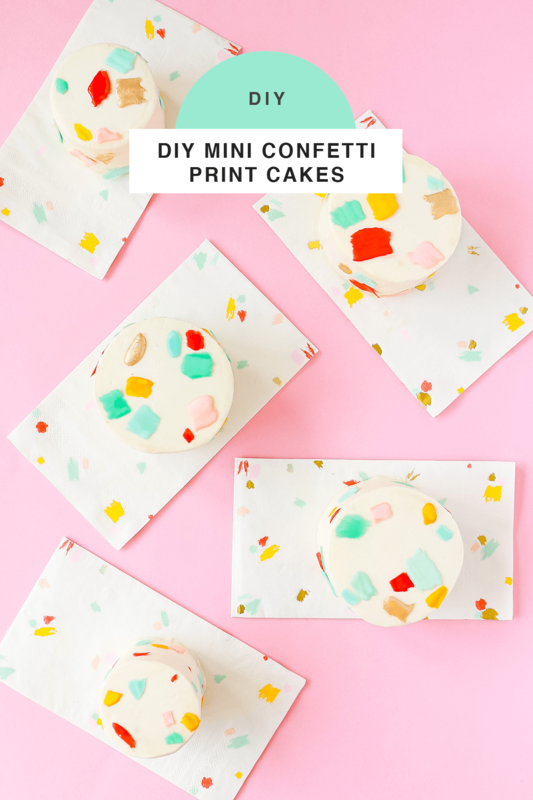 As soon as I saw the adorable confetti napkins from the Sugar & Cloth Shop line, I knew that I wanted to translate the print onto a cake. If you’re familiar with my work you may already know that I, Alana, love little details so needless to say I was enthusiastically interested in this brush strokes napkin print! My idea was to create a batch of mini cakes that were not only decorated to match the napkins on the outside of the cake but also had a subtle touch of confetti inside as well. 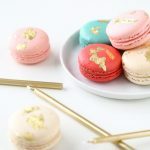 So it’d essentially be similar to a funfetti cake on the inside, but instead of searching for hours to find the perfect color coordinated sprinkles or candy from a store, I’ve decided to show you how to make your own candy from icing that can be used inside and outside of the cake to achieve the fun confetti print pattern. 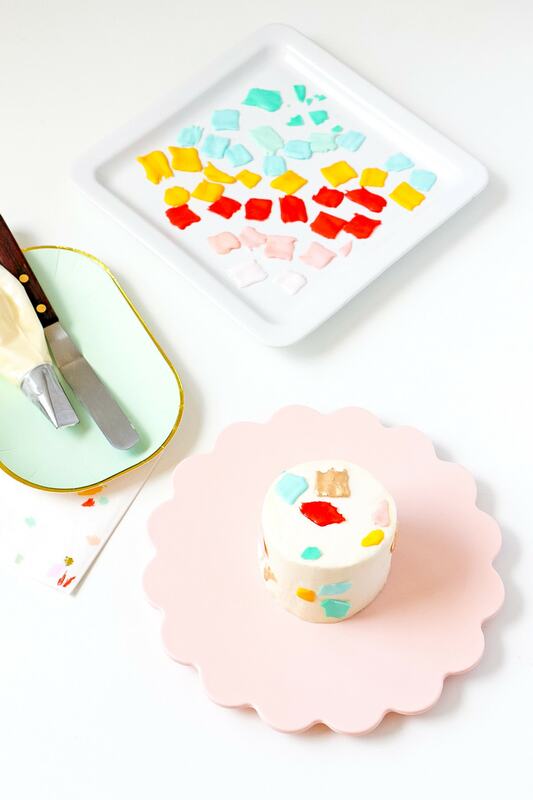 These colorful icing candies are very easy to make, and thanks to a wide array of food coloring options, the customization of the candy colors are limitless. If you’ve decorated cookies before this process will feel familiar, as we’re essentially making royal icing. First, add the powdered sugar and cream of tartar into your mixing bowl, and stir to mix. Using a whisk attachment, turn your mixer on to low speed and slowly add in the liquid egg whites. Once combined, turn the speed to medium and whisk for 1 – 2 minutes until the icing forms soft peaks. Add in 1 teaspoon of warm water, as well as any flavored extract (optional), and mix until combined. 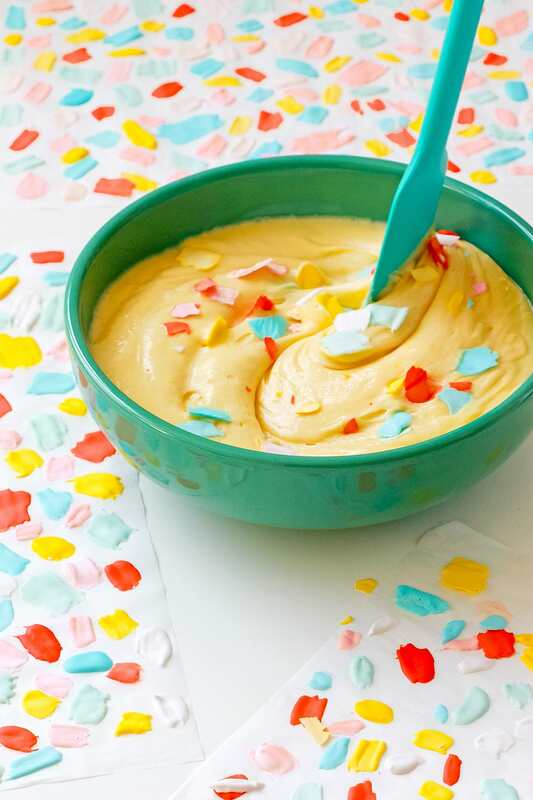 Distribute the icing between bowls, designating one bowl per the desired color. Add in 1 – 2 drops of food coloring to each bowl, and mix with a spoon. If you’re following along with the napkin print, you’ll need yellow, pink, peach, light blue, teal, and red. Set a piece of parchment on a baking sheet or a level work surface. 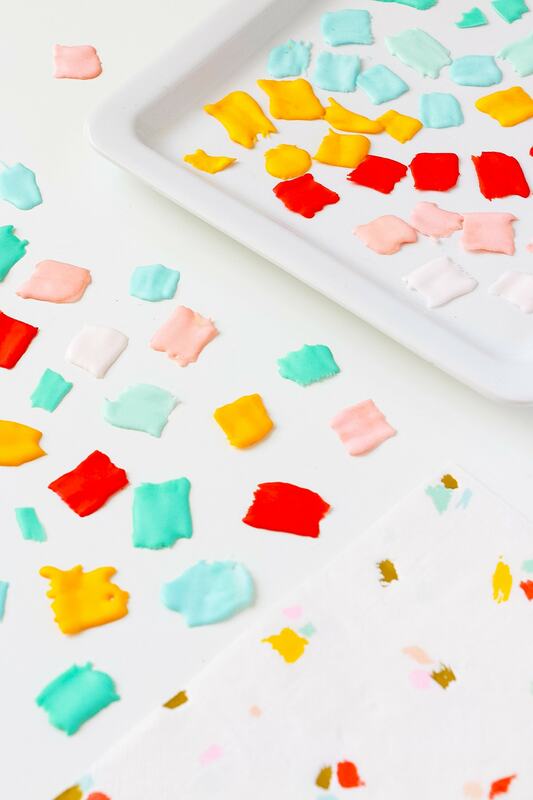 Use food-safe brushes to add brush strokes of each icing color onto your parchment and set aside to dry overnight. 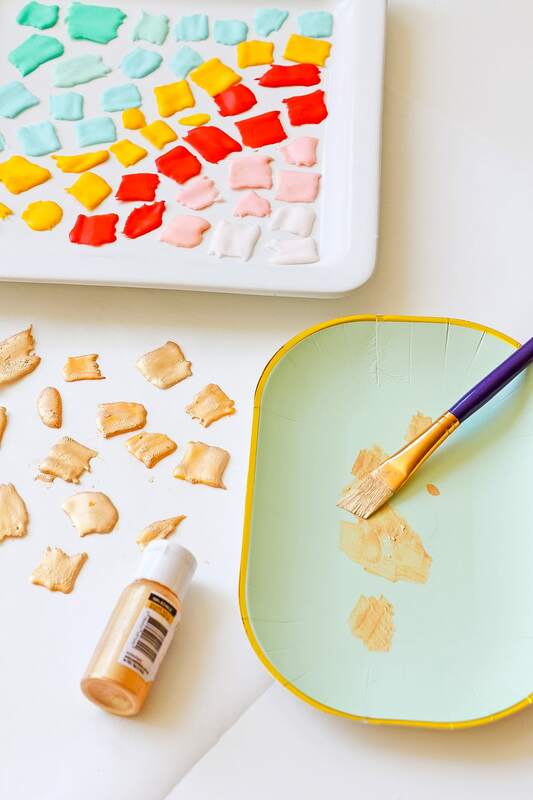 For the gold pieces, wait until the icing candies are completely dry, then brush a handful of them with gold cake paint or luster dust. Preheat the oven to 350 degrees F. Line two rectangular cake pans with parchment paper and coat with cooking spray. Prepare your choice of white or vanilla cake mix as directed. 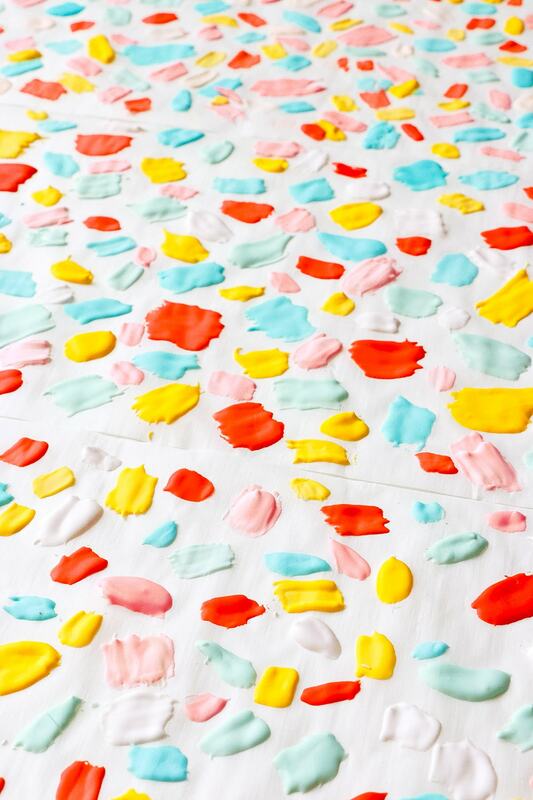 Add a handful of the dried icing candies to the batter. 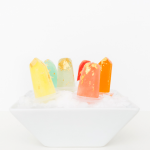 Use a spatula or spoon to break the candies down to small (¼-inch or smaller) pieces. Divide the batter between the pans and bake 15 to 20 minutes. Once cakes are completely cool, use a circular cookie cutter to cut out circles of cake. Assemble cakes, three layers high with frosting in between each layer. 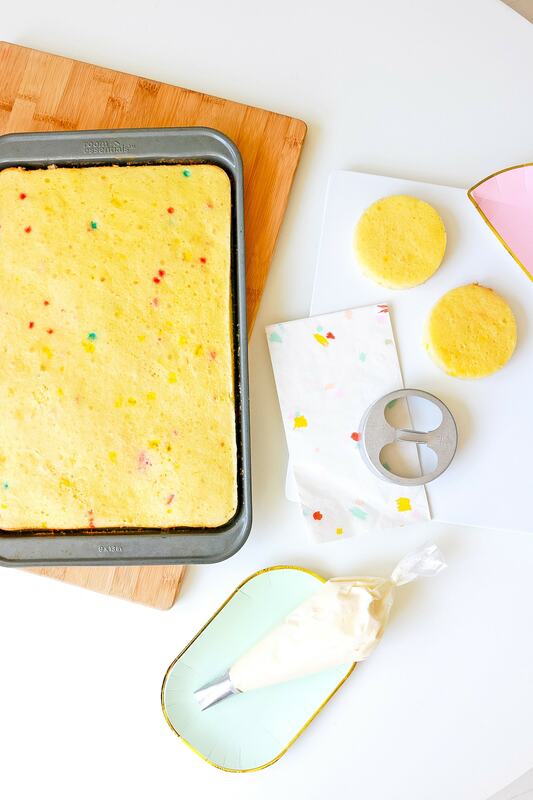 Use a spatula to frost the exterior of the cakes. Frost an initial (crumb coat) of frosting around the cakes, freeze the cakes for 10 minutes and then add a second layer of frosting. 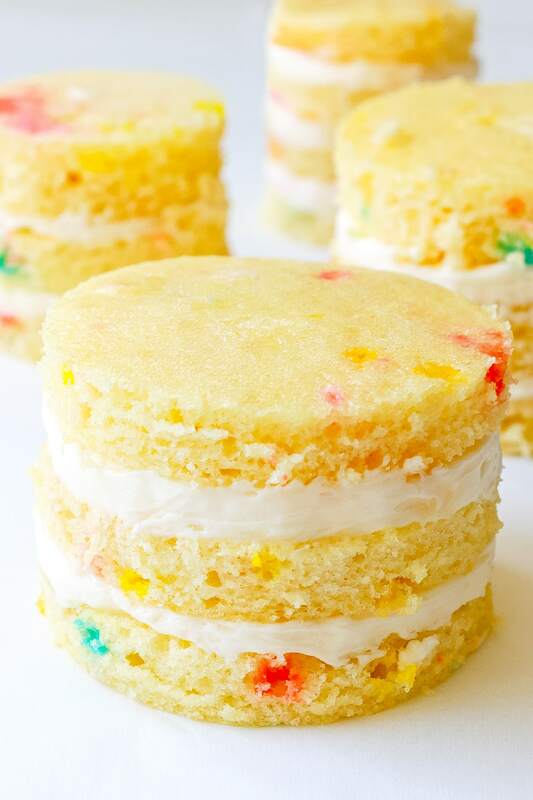 Once frosted and smoothed with a spatula, add your candies around the outside of the cakes. 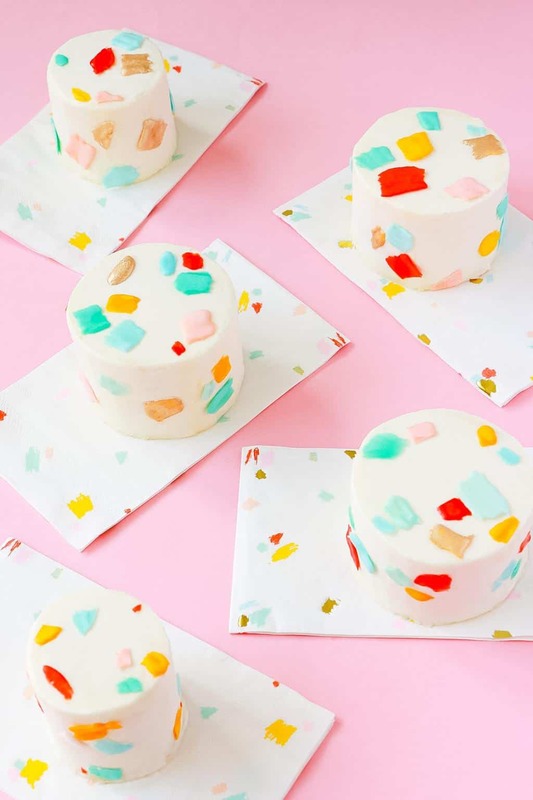 Completely custom and ridiculously cute, these mini cakes are sure to be a huge hit at your next party! You can also snag the Sugar & Cloth marble servers and mint green paper plates that I used right here too! 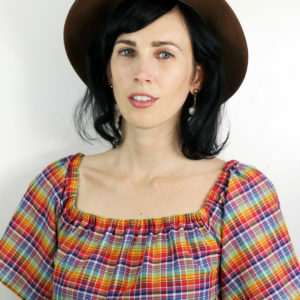 Alana is a designer and baker living in Los Angeles and has been sharing her dessert creations since 2013. Her projects are design works that she hopes to leave you feeling inspired! Hi – these are so cute! 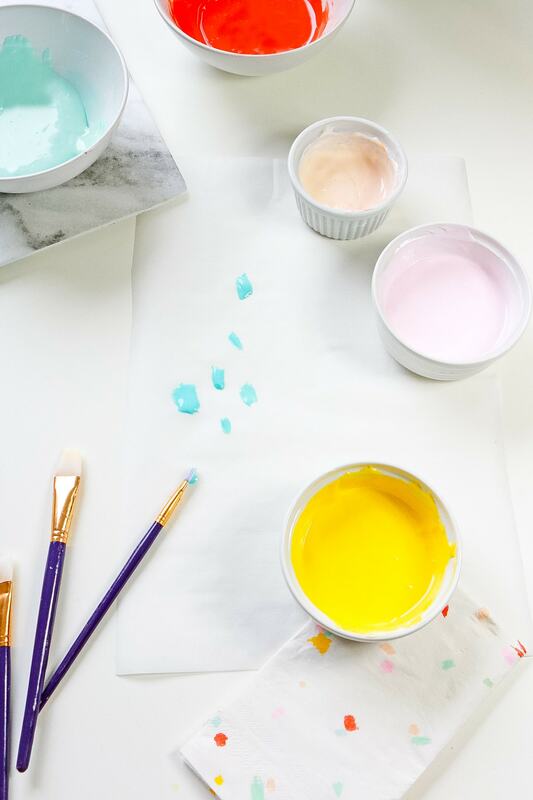 One question, when using the egg whites to make the paint chips is it safe to eat them? Thank you! Hi Darby! Yes, it is safe because liquid egg whites are pasteurized. :) Let us know if you try it out! So adorable! And so delicious! I can’t wait to make a bunch more of these! Wow , thank you Sean! Let us know how it goes !